In an interview with Eurogamer, Sega's Takashi Iizuka talked about his plans for the company's long-running (but seemingly constantly creatively ailing) Sonic The Hedgehog franchise. Among other kernels of knowledge (Sonic is "the right fit" for Wii U, whatever that means), we learned that despite his daliances kissing human girls, he will never become photo-realistic. And I think I speak for us all when I say, "Well thank goodness for that." 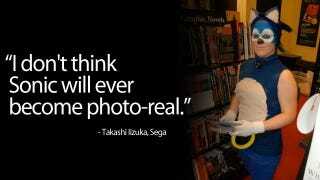 In addition to not making the photo-realism mistake, hopefully the folks at Sega will listen to Tim Rogers and take some of his tips on how to make Sonic stop sucking.